Frequently asked questions and their answers about the basic physical principles of pressure and pressure measurement, including discussions of absolute pressure, atmospheric pressure, gauge pressure, and differential pressure. Pressure is generally defined as a force that acts uniformly over a defined area. There are several types of pressure and ways to measure them. Gauge pressure, also called overpressure, is the pressure of a system above atmospheric pressure. Gauge pressure is zero-referenced against ambient air (or atmospheric) pressure, so gauge pressure readings include the pressure from the weight of the atmosphere. What this means is that gauge pressure varies according to height above sea level as well as to weather conditions. Given that all of the processes in a refinery or manufacturing plant are at the same air pressure, gauge pressure measurement is sufficient for most industrial applications. 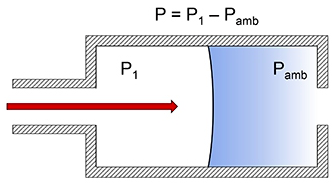 What is the relationship between gauge pressure and absolute pressure? A pressure measurement based on a reference pressure of zero, or no pressure at all, is known as absolute pressure. Zero pressure exists only in a perfect vacuum, and outer space is the only place where this occurs naturally. 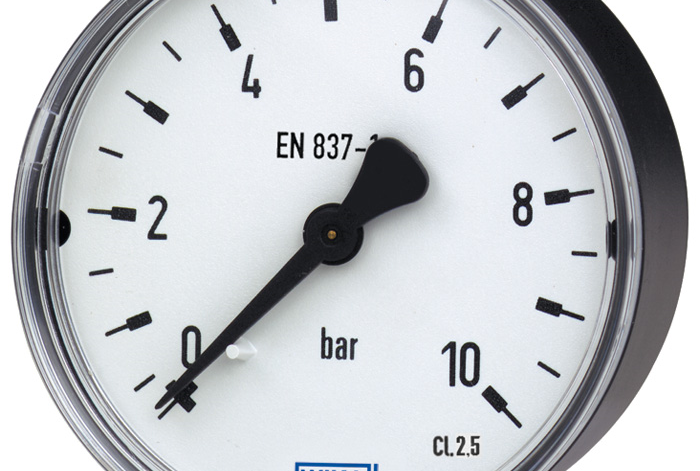 Therefore, an absolute-pressure reading is equal to atmospheric (ambient) pressure plus gauge pressure. That means gauge pressure is equal to absolute pressure minus atmospheric (ambient) pressure. When the absolute pressure is greater than the atmospheric pressure, the condition is called positive overpressure; when the absolute pressure is less than the atmospheric pressure, it is referred to as negative overpressure. The atmosphere of the Earth has weight and creates pressure. Also called barometric pressure or ambient pressure, atmospheric pressure is subject to weather-dependent fluctuations. Natural phenomena such as cyclones and anticyclones can cause atmospheric pressure to vary by as much as 5%. Differential pressure is the difference in pressure between two points in a process. A differential pressure gauge typically has two inlet ports (one for each of the monitored points). A differential pressure gauge means that operators do not need to constantly monitor two separate gauges and determine the difference in readings. Differential pressure gauges are used in many industries as part of control systems for filtration, liquid levels, and liquid flow. What units are used to measure pressure? In the United States, the units used most commonly to measure pressure are pounds per square inch (psi), bar, and millibar (mbar). The International Standard unit for pressure is the pascal (abbreviated as Pa): N/m2, or newton over square meter. 1 bar = 100,000 Pa. Pressure can also be measured in atmospheres (atm), inches of mercury (in. Hg), millimeters of mercury (mm Hg), and torr (about 133.3 Pa). The unit used depends on the pressure instrument, the industry, and a country’s preferences and measurement standards. The experts at WIKA are happy to answer any questions you have about gauge pressure in general and about WIKA’s pressure gauges and sensors. Absolute Pressure Gauges – When Do You Need Them?